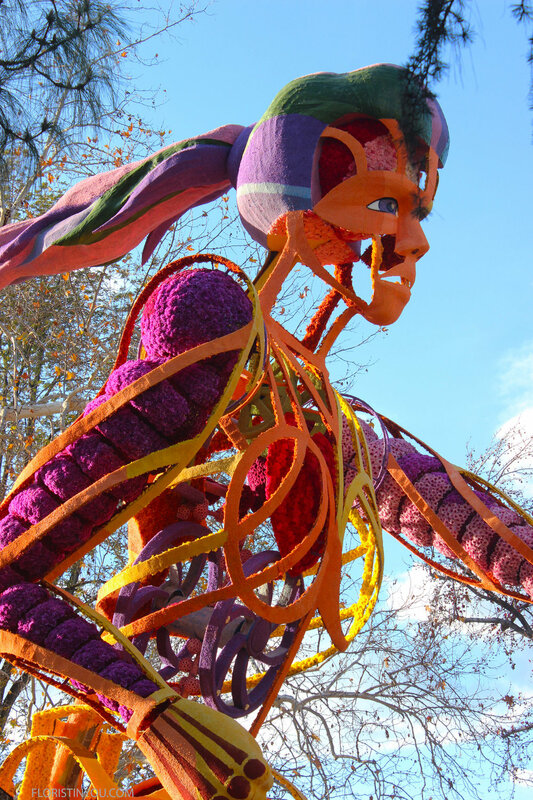 The floats for the Rose Parade in Pasadena, CA are made with 18 million flowers. 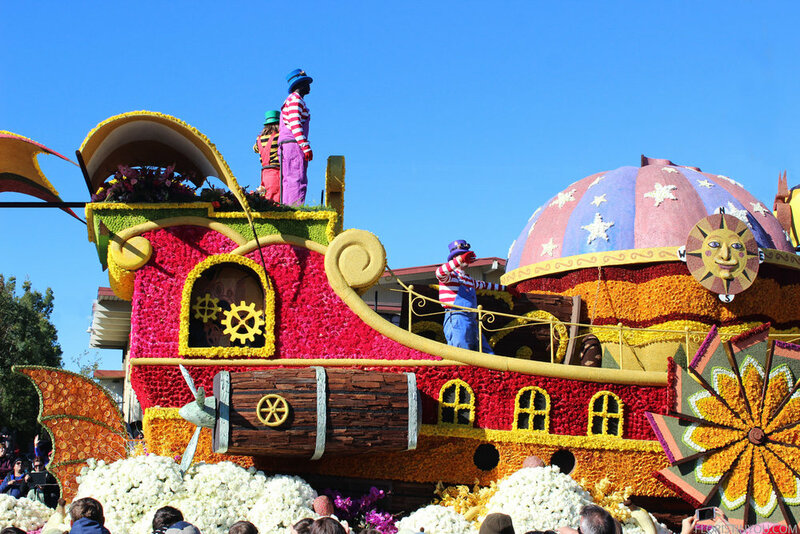 There was a record breaking nine floats this year that earned the certification California Grown for the Rose Parade. Yeah California. We were in the crowd by the Rose Bowl, where some of the floats are made, and saw Karen Ross, Secretary of the California Department of Food and Agriculture, presenting awards for floats using California grown flowers. She also received an award for promoting California Grown flowers. This presentation was made in the huge crowd watching as workers put the last flowers on floats before the parade. The flowers are attached to the floats by volunteers. Every cut flower has it’s own vial of water to keep it fresh, and each float must be covered in flowers, petals, seeds, leaves, stems or vegetable material. The UPS float won the sweepstakes award for being the most beautiful and it featured Olive the Ostrich, reading a book. Olive’s head, neck and legs were adorned with 30,000 pink Mizuky carnations and her plumes were made with 40,000 white Dendrobian orchids. 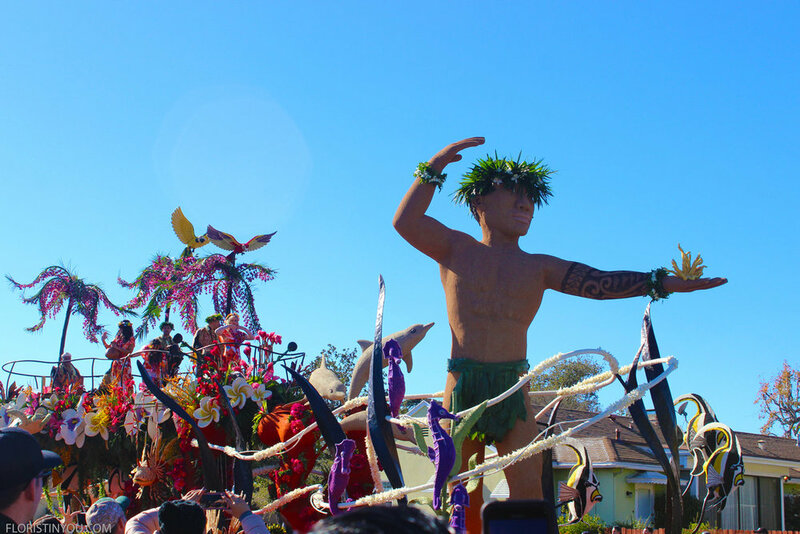 The flowers, creativity and whimsy displayed on the floats are amazing. This year there were 46 floats. Bands come from all over the world and there were 21 marching bands. There were 18 equestrian units with many beautiful horses including wild Palomino Mustangs, Clydesdale and miniatures. 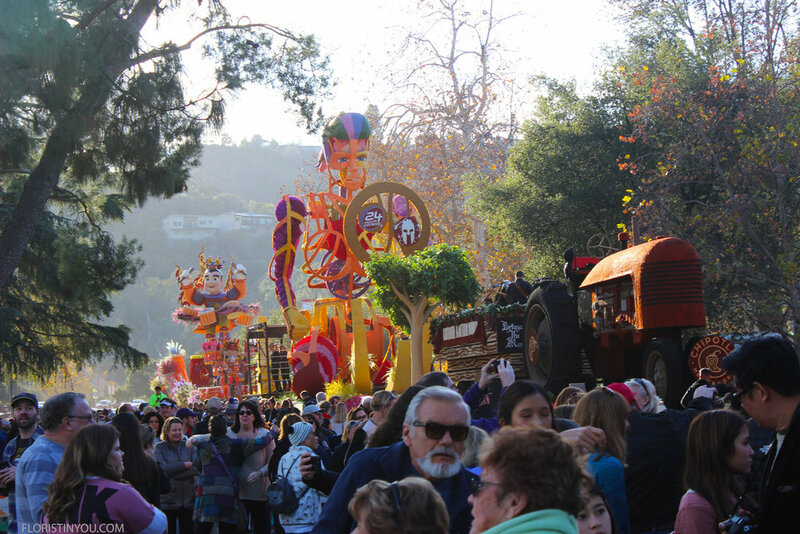 The Rose Parade in Pasadena kicks off the New Year. Hardy enthusiasts sleep outside on the parade route, and this year it was cold. That, of course, is accompanied by marshmallow wars between those driving down the route and those sleeping out. You are best advised to take an old car that you won’t mind getting covered with marshmallows and silly string. And don’t think we are just talking about the outside of the car. You will probably get a few tacos with shaving cream on your windshield too; hopefully you won’t get one on the inside of your car. It’s a lot of fun, especially when the crowd counts down to New Year. 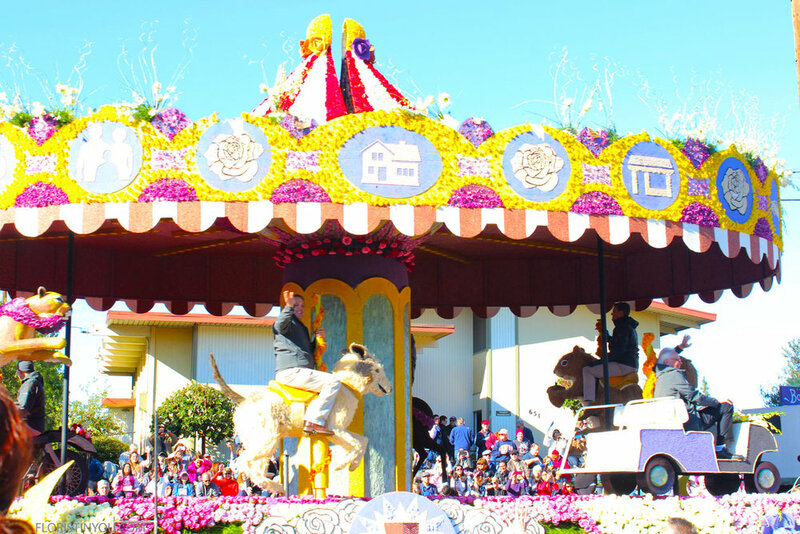 Olive the Ostrich won the Sweepstakes Award for the most beautiful float. Look at those legs! Olive’s plumes were made of 10,000 white Dendrobian Orchids. Wow! Finishing touches placed on floats by the Rose Bowl on New Year’s Eve. Blue Diamond’s float promoting Almond Milk. Love the bees. Those bees are still working. Cal Poly’s “Far Out Frequencies” wins Extraordinaire Award. The 24 Hour Fitness float had people in a gym exercising in it. The American Armenian float depicts the whistling Chanting Stones: Karahunj which predate Stonehenge. Trader Joe’s won the Crown City Innovator Award. Taiwan by China Airlines won the International Award. Taiwan…the flowers, colors and costumes and face painting were amazing. “A Carousel of Experience” won the Queen Trophy for most outstanding presentation of roses. Fun. A family of elephants taking selfies by N.W. Mutual. N.W. Mutual float, “Spend Your Life Living” won the Bob Hope Humor Award. Big Bear was the Golden State Winner. Dole won the Wrigley Legacy Award. The theme was “Rhythm of Paradise”. It was gorgeous. Toothless and Light Fury’s first date and Astrid and Hiccup. Astrid and Hiccup with a two headed dragon. I love the bumps on Meatlug. Very cute. 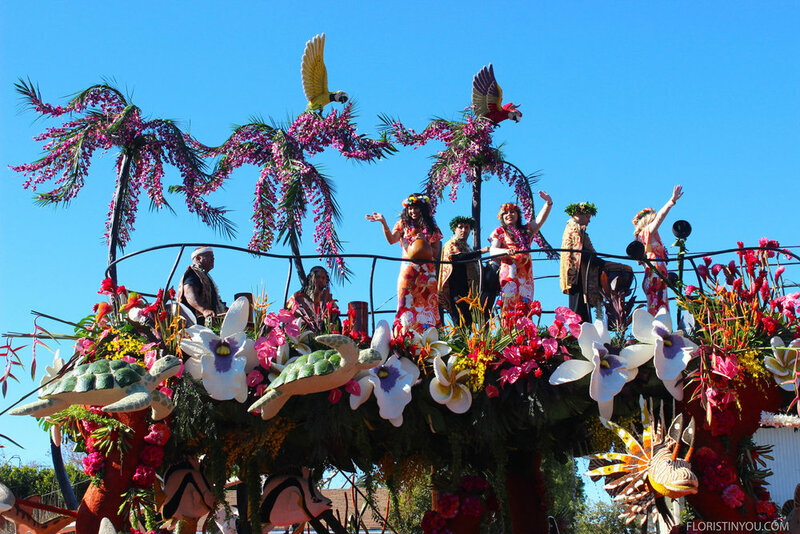 This float used over 5,000 roses, 8,000 carnations & thousands of orchids and mums. “How to Train Your Dragon” won the Showmanship Award. I loved it.